We couldn’t have asked for more in Trump’s Inauguration Speech! Trump gave an Alt-Right Speech right down the line, We couldn’t have asked for more! Donald Trump inspired us in his first speech as OUR President. Donald Trump stood up on the steps of the Capitol virtually surrounded by powerful establishment political sellouts and Jewish Neocon warmongers, open borders traitors — and he declared war on them. Trump evoked my campaign slogan I used in my successful race for the House of Representatives, and I used in my quest for the Republican nomination in 1992, America First. 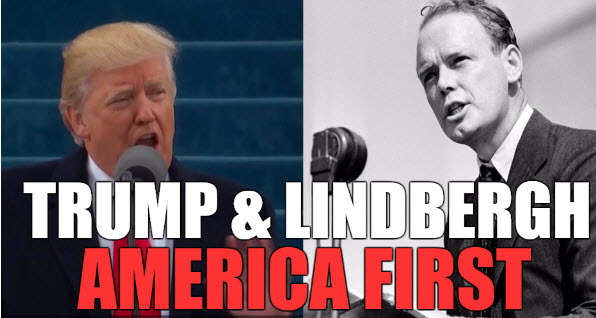 This is the historic slogan of the original Alt-Right and all patriotic Americans in days of Charles Lindbergh and the America First Party later that has stood up against both the Jewish globalist Commies and the Jewish globalist Capitalists. Although there are a number of Jews around Trump, there is no doubt the Jewish-elite tribalist establishment hates Trump. Trump demands that America must come first and that we should stop paying for the defense or the public or financial support of other nations and put America First. The Neocons know that Israel is the worst offender offender of all. Because of their agents in American power centers, Israel gets billions more of our dollars and weapons than all the other nations of the world combined, and more direct monetary support than the rest of all the nations of the world — about half! An example of their treason when it was revealed that these Neocon “Intelligence Officials” warned Israel, a foreign government, not give intelligence to America under Donald Trump. That’s plain out treason to try to prevent our nation from getting possibly vital information putting a foreign nation’s interests over our own. When Trump makes the pledge to stop this insanity, the Jewish Neocon Warmongers know he speaks of them. That’s why they have hated him from the start and still hate him and plot against him right now to destroy his presidency both in backroom politics and in their media control. Just as in his last great campaign commercial, Trump also called out the Jewish-dominated financial interests who have robbed us blind and transferred our wealth to the rest of the world, and most importantly to themselves! Is Trump following the dictum of keeping your friends close but your enemies closer? Is this the strategy when he hangs around Jared Kushner and the Goldman Sachs Criminal Bankers? Probably if he hadn’t had done this, he would objected to in the Senate and might not be President today! Stopping the immigration which every awakened white person understands is meant to ethnically cleanse us from our nation and our brothers in Europe as well. During the campaign Trump thanked and praised by name, Blacks, Mexicans, and of course Jews, but like all the politicians he didn’t dare to mention us by name, we his most ardent supporters: White people, in order to get elected. It was only implicit appeals, not explicit. But, he is evolving. Today, now that he is the commander-in-chief, Trump talked about how he would be good for all Americans, including Blacks and Browns and yes.. he then actually used the “W” Word, he included WHITE PEOPLE, our people in his pledge as the new President. Recent polls have been proclaiming sarcastically that the only race that gives him a favorable rating are whites. No sarcasm is needed. Without us he could not have won. Without us he can not survive. And without us, as we all know, that the America as conceived by our forefathers can’t survive. Trump’s election is a great victory for us, but for our people to survive and go forward, we must continue to move Trump to the full and deeper meaning of his message, that our heritage, our culture, our prosperity, our values, our very people themselves must be preserved. White people have the most basic human right of all: to live, and we have a right to govern our own nation rather than have these unelected Jewish tribalists run our politics, our foreign policy, our media, our banking institutions. An no one, no where will prevent us our right of self-preservation. The Jewish Neocons realize that his programs and agenda is completely against the agenda of the Jewish elite establishment. How can Trump, then not know it? This election victory will be known to future generations at our time when our race is saved and our people are training their vision on the stars — They will see this date: January 20, 2017 as the beginning of the revolution that will save our people and insure the future of our children! But the ultimate victory won’t be won unless we of the Alt-right to continue to lead it and give it power! As the Band played after his speech: “Hail to the Chief!” Yes, Hail Trump!